1. Flexible with impact resistant characters. 2. High quality products, Europoean and US standard. 3. 5050 SMD LED adopted,high brightness ,stable performance. 4. Energy saving and environmental friendly. 5. 5m/roll is the standard package, customized package as per your require. 6. Each unit of 6LEDs can be cut out at regular segments. 7. Cool White, warm white,red,green,blue and yellow color and RGB available. 9. DC24V: it is safe for underground workers. 10. Power Input: 110V-250V with suitable usage range. 11. Superior to traditional tunnel mining light, it is easy installation, high brightness without blind corner lighting. 12. Flexible and super toughening silica gel material, waterproof connector and Voltage IC Controller, Temperature IC Controller, so strip lighting designed especially for underground mines. 3. Less brightness blind corner. 4. Quick and easy installation, as opposed to bulky, conventional lighting. 5. High strength design ensures that the lighting can be relocated at ease without any damage to the lighting. 6. Variable Voltage Supply Capability. The LED technology utilised in the development and manufacture of Lighting is of the highest calibre available. The design components and innovations work together in perfect synergy to provide an unmatched lighting solution. Green Lighting is designed to thrive in the harsh underground mining conditions of high ambient temperature and moisture as well as rough manhandling, for at least a decade or more. 1 year warranty and still be responsible for you after cooperation. Green Lighting led strip lights was developed according to customers' feedback to ensure full compliance with the statutory requirement for equipment installed underground and are confident of our full compliance thereof. 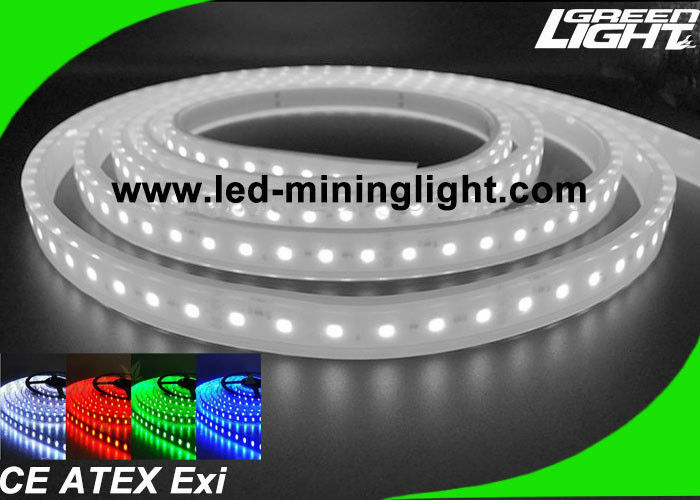 Green Lighting is Exi approved as well CE approved and currently undergoing approval by Msha. GL-XLM-GS01 strip lighting are being fully convinced of its superiority in comparison to all lighting systems the industry has to offer, and its immense money saving properties making it the only choice for the underground environment.